Okinawa, and the banquet began after a 30-minute delay. 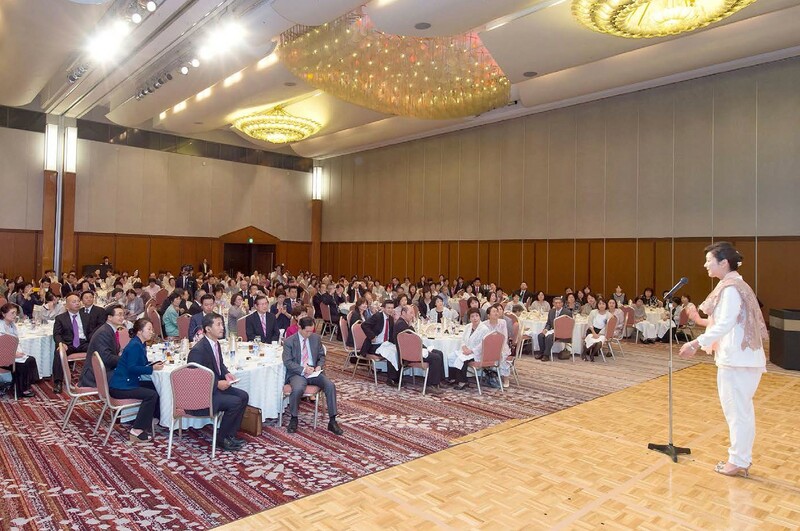 The 252 persons of merit from the Region 12 in Fukuoka who gathered at the Hilton Fukuoka Seahawk Hotel welcomed FFWPUI Director-General Sun Jin Moon with a flood of emotions and applause. Mr. Yasuo Takamatsu, leader of the North Fukuoka Parish and emcee, opened the event. Following a representative report prayer by Mrs. Keiko Karami, women leader of the Fukuoka Parish, a second-generation couple, Takahito Kajiwara and Kimi Muraoka, presented a bouquet of flowers to Sun Jin Nim’s couple. Next, President Eiji Tokuno of the Unification Church of Japan gave the organizer’s greetings. Emphasizing that Sun Jin Nim’s couple visited Japan on behalf of the True Parents, and after the Global Youth Festival was held with tremendous success on Sept. 23 at the Makuhari Messe, the only areas in Japan they were touring would be the Region 13 of Okinawa and the Region 12 of Fukuoka and Saga. The banquet was opened with a toast by Nagasaki remarks. Parish Leader Bong Kyu Song, and for entertainment, the Fukuoka Sunhak Chorus performed four songs. When the children gave greetings, “Sun Jin Nim! Welcome to Kyushu!”, the couple also greeted the children, and truly enjoyed their angel-like singing. Perhaps they were familiar with the song, “Hana wa Saku (the Flowers Bloom)” as the song for the East Japan Great Earthquake. As Sun Jin Nim wiped her eyes during the song, the participants also were deeply moved, and the entire hall was filled with emotion. When the encore performance of “Inochi no Uta (Song of Life) was finished, Sun Jin Nim’s couple went on stage immediately, and took a commemorative photo with the Sunhak Chorus. Following the entertainment, all of the participants rose by Parish with their elders, and offered bows of gratitude to Sun Jin Nim’s couple. Amidst the gratitude and the high emotions, Sun Jin Nim rose to the podium and gave her remarks. When Sun Jin Nim closed her remarks, the hall was filled with thunderous applause and cheers that did not stop. Amidst the amazing atmosphere, Fukuoka Parish Leader Dong Soo Cheong offered four cheers of Eok Mansei. In closing, commemorative photos were taken by each Parish, and the event came to an end filled with much grace and inspiration. Next story Walking With God Every Day, All Day!